A biosimilar medicine is a biological medicine which is highly similar to another biological medicine already licensed for use. It is a biological medicine which has been shown not to have any clinically meaningful differences from the originator biological medicine in terms of quality, safety and efficacy. 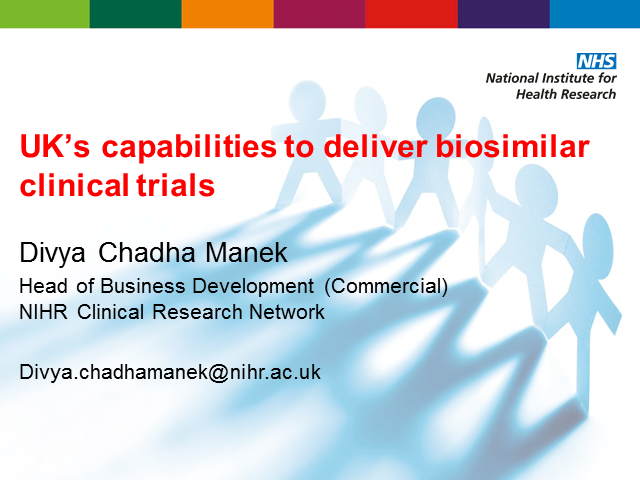 This presentation will discuss NIHR Clinical Research Network support for Biosimilar clinical trials. It begins with a background to biosimilars and the changing landscape in their drug development and regulatory pathways. It then focuses on the opportunities that the NHS via the NIHR CRNs can engage in biosimilar clinical trials across therapeutic indications. A webinar that provides an overview of NIHR metrics, what they are and how they are calculated. This webinar is designed for the NHS research community. Join NIHR Clinical Research Network Research Delivery Director Dr Clare Morgan and HRA Chief Executive Janet Wisely, to explore the new HRA Approval process, its implementation and how the organisations are working together to improve the clinical research environment. •Are you looking to deliver your research within Europe? •Do you need multiple, reliable sites and experienced investigators? •Do you want to know why you should come to the UK? In the past the UK’s reputation for delivering clinical research was questionable. But that has all changed with the Department of Health’s investment in the clinical research network infrastructure in the UK. Over the last seven years the research landscape in the UK has improved dramatically allowing the UK to make great strides in delivering research for the Life Sciences industry. So whether you are a Pharmaceutical Company, Contract Research Organisation, Biotech, Med Tech or Diagnostic company we can help. The NIHR Clinical Research Network is hosting a live webinar which will explode common myths around the UK’s ability to deliver commercial clinical research. This session will be hosted by Dr Matt Cooper, Business Development and Marketing Director, of the National Institute for Health Research Clinical Research Network (NIHR CRN). It will include performance data that will demonstrate why the UK should be your first choice for running clinical research studies. The NIHR CRN is exhibiting at the BioPharma Asia Convention 2016, visit stand B22 from 22-24 March to find out more about what we do to support clinical research and how we can help you deliver your studies in the UK. In the past the UK’s reputation for delivering clinical research was questionable. But that has all changed. Over the last seven years the research landscape in the UK has improved dramatically allowing the UK to make great strides in delivering research for the Life Sciences industry. So whether you are a Pharmaceutical company, Contract Research Organisation, Biotech, Med Tech or Diagnostic we can help. Patient & Public Involvement and Engagement Priority Lead, Jenny Preston, gives an overview of what we mean by a Patient Research Ambassador, the role of a Patient Research Ambassador, why we need Patient Research Ambassadors, why the initiative exists and how people can get involved. •Is your company seeking to enter the clinical trial process? •Do you need expert advice on setting up a study? •Would you like help developing your protocol for the NHS environment? Supporting high-quality commercial contract clinical research across all therapeutic areas is a high priority for the National Institute for Health Research Clinical Research Network – the research delivery arm of the NHS. We support the full spectrum of commercial clinical research including medical technology, device and diagnostic studies in addition to pharmaceutical products. We have dedicated research support staff and services to assist with study delivery at site level. This infrastructure provides you with unparalleled access to, and understanding of, the NHS research environment. If you would you like to know more about our services you can join our live webinar hosted by Matt Cooper, Business Development and Marketing Director. This live online event will include a 30 minute presentation followed by an opportunity to ask questions. This session provides a local Trust perspective on how the Industry Costing Template can be practically embedded for financial management of commercial research studies. A brief overview of the national tool principles is provided, but the main focus of the session is on practical examples of how these principles have been locally developed and implemented to support investigator and directorate incentivisation to encourage involvement in commercial contract studies. Who should view this session? "Financial Management of Commercial Contract Studies: A Trust perspective" is a must see for all NHS staff supporting commercial research including R&D and Finance teams, as well as Local Clinical Research Network staff supporting Trusts in their area to conduct commercial contract research. As part of the Network's HSJ award category sponsorship, Danetre Medical Practice were highly commended for the entry to Clinical Research Impact. Jo Gilford, Practice managing partner, and Laura Hopwood, research nurse, discuss their story and how the practice turned research into core business. This session gives an overview of the support available from the NIHR Clinical Research Network life-sciences industry team at a local and National level and explains how the network works in partnership with you to ensure your study is set up rapidly and recruits to time and target. Guidance on communication routes and our query resolution pathway is included. The webinar will also look at up to date performance data, how we collect it and how this information is transformed to ensure studies and sites are actively managed to deliver. "Getting the best from the Network" is a must see for any CRA, Start up manager, study manager or NHS R&D manager who is involved in setting up and managing commercial contract clinical research in the NHS. - Are you looking to deliver your research within Europe? - Need multiple, reliable sites? - Do you want to know why you should come to the UK? In the past the UK’s reputation for delivering clinical research was questionable. But that’s all changed. Over the last six years the research landscape here has changed dramatically allowing us to make great strides in delivering research for the life-sciences industry. So whether you’re a small CRO, a medium med tech, or a pharma giant - we can help you. - Are you working for a Contract Research Organisation (CRO)? - Are you looking to place your research within the UK? - Do you want to know how the CRN can help deliver your study? In the past the UK’s reputation for delivering clinical research was questionable. But that’s all changed. Over the last six years the research landscape here has changed dramatically allowing us to make great strides in delivering commercial contract research. The National Institute for Health Research (NIHR) Clinical Research Network is hosting a live webinar which will explain how we work together with CROs to meet the needs of the life-sciences industry. Not only will we explode common myths around the UK’s ability to deliver commercial contract research, we will also use performance data to demonstrate why the UK should be your first choice for clinical research delivery. This webcast provides comprehensive training for effectively using the latest version of the NIHR Clinical Research Network (CRN) standardised Industry Costing Templates (Version 2.2) for a commercial research study to help create a realistic starting point which can be negotiated with NHS Organisations. 2. Line-by-line user instructions for each section of the templates. This will help you make the most of the built in features of the template and make it easier to complete and use. The Health Service Journal Clinical Research Impact award winner, Sussex Partnership NHS Foundation Trust, has created an inclusive research network which has given the public, patients, carers and staff the opportunity to learn about and get involved with research in their community. Find out why Sussex Partnership were determined to make clinical research everyone’s business and how they implemented their new initiatives. This session shares best practice and is aimed at NHS Trusts/primary care practices. The key to successful negotiation is preparation and knowledge; these training modules investigate the commercial research environment, delve into the position of the various stakeholder involved and provide both research specific and general negotiation tips to support you in clinical research. This module sets the scene for the environment in which commercial clinical research negotiation takes place and considers the importance of maintaining a mutually beneficial partnership approach between the life-sciences industry and the NHS when working together to deliver clinical trials. The latter part of first module goes on to detail the position of the life-sciences industry, from the challenges currently faced to the regulations they must adhere to and the links between specialist budgeting tools and the national costing templates. This module considers the position of the NHS providing both healthcare to the nation and a commercial research service offering. The session details the currently challenges faced by the NHS, breaks down the national cost template methodology in relation to NHS costs and considers the role of the Government’s national tariff for healthcare. Session three describes the role of the Network as a mediator in commercial trial negotiations. It investigates topics specific to commercial contract research such as the budget confidence, the cost of medicines, set-up fees and alternative costing approaches. Also included are more general tips in relation to negotiating - recognising and handling conflict, building rapport and motivating parties to reach an agreement. Together, these modules provide in-depth knowledge around commercial clinical research cost and contract requirements for all parties involved and provide the practical skills to help you be more prepared when negotiation is required.